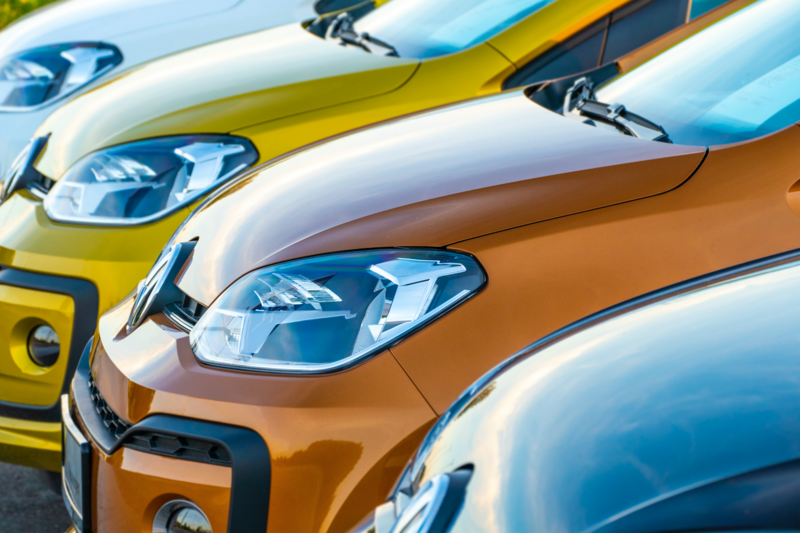 Parkside Advisors | Buy, Lease or Loan a New Vehicle? During financial planning discussions, many clients ask for suggestions about the best financial approach when acquiring a new car. There is a simple answer: One should own and operate a reliable car for as many years as possible. The declining annual depreciation combined with low maintenance expenditures will result in the lowest average cost per year over time. As is our practice at Parkside Advisors, we like to use Excel and help our clients compare the numbers. 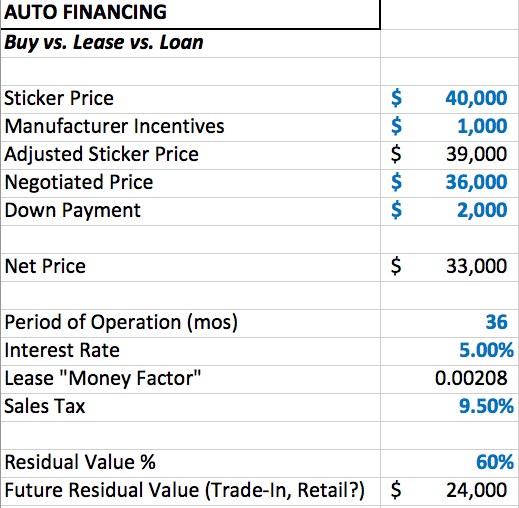 We’ve created a simple one-sheet model with the three acquisition methods side by side. This analysis assumes that the automobile is acquired for the same duration under each payment scenario. Adjustable inputs in blue show the client how sensitive their all-in cost per year is if changes are made to the assumed purchase price, interest rate or residual value. For the purposes of this analysis, we assume that the client is indifferent to the use limitations of leases (such as the 12,000 mile/year limit). We also assume the client is indifferent to the cash demands of writing a check for the car versus leasing. We do not include all the standard operating expenses of a vehicle such as insurance, fuel and registration fees as they will be the same regardless of how the vehicle is acquired. We believe the value of the model is in the sensitivity analysis that it provides, especially for understanding the impact of changes in the interest rate and residual value assumed. This is where there can be significant room for clients who are willing to negotiate with car dealers. For clients who are interested, we can share additional insights on the information available on the internet that will bolster your negotiating strength and allow you to know when a lease offer’s “money down + monthly payment” is too high. If you are in the market for a new vehicle and are interested in a copy of the Excel model, please contact us. The material in this blog is for informational purposes only. You should not construe any such information or other content as legal, tax, investment, financial, or other advice. Nothing contained in our blog constitutes a solicitation, recommendation, endorsement, or offer by Parkside Advisors or any third party service provider to buy or sell any securities or other financial instruments in this or in in any other jurisdiction in which such solicitation or offer would be unlawful under the securities laws of such jurisdiction. All material in this presentation is information of a general nature and does not address the circumstances of any particular individual or entity. Nothing in the presentation constitutes professional and/or financial advice to any specific firm client, nor does any information in this presentation constitute a comprehensive or complete statement of the matters discussed. Parkside Advisors does not become a fiduciary to any participant or other person or entity by virtue of any person’s use of or access to the presentation. The content presented represents the interests and opinions of Parkside Advisors only. Blog content also may include material obtained from third party sources. We believe all content presented in the blog is reliable and current however we provide no guarantee of accuracy. You assume the sole responsibility of evaluating the merits and risks associated with the use of any information or other content in the blog before making any decisions based on such information or other content. In exchange for using the blog, you agree not to hold Parkside Advisors, its affiliates or any third party service provider liable for any possible claim for damages arising from any decision you make based on information or other content made available to you through this site. There are risks associated with investing. Investing in stocks, bonds, exchange traded funds, mutual funds, and money market funds involve risk of loss. Principal loss is possible. Some high risk funds may use leverage, which will accentuate gains & losses. Foreign investing involves special risks, including a greater volatility and political, economic and currency risks and differences in accounting methods. A security’s or a firm’s past investment performance is not a guarantee or predictor of future investment performance.